Elyse Ashe Lord lived in Bexley, Kent. A watercolourist and drypoint etcher, she favoured exotic and Far Eastern figure subjects, often treated in delicate or imaginative colours. Little is known about her early life although she held her first important solo exhibition of 70 drawings at the Brook Street Gallery in 1921 and in the following year was elected a member of the Royal Institute of Painters in Water Colours. She was also a member of the Society of Graver-Printers in Colour. She exhibited actively from 1915 to 1939, showing at the Royal Academy, Royal Institute of Painters in Water Colours, Royal Scottish Academy, Walker Art Gallery, Liverpool, Fine Art Society, Lefevre Gallery and at the Paris Salon, where she gained a silver medal for colour prints. 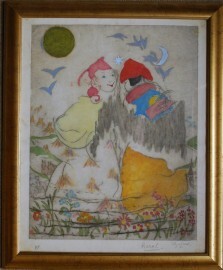 Alexander Reid issued much of her work in book illustrations, including The Arabian Nights and in 1990 Cyril Gerber Fine Art held an exhibition of her work. Her work is represented in the collections of the British Museum and Victoria & Albert Museum.